WHAT ARE THE MINIMUM REQUIREMENTS TO DIVE AT KRAKEN SPRINGS? All divers must be either a certified open water diver with proof from a major certification agency (PADI, SDI, SSI, NAUI, etc) for photocopy on site OR be with an active certified instructor with current professional insurance diving under his instruction. Lack of certification card on site or, for instructors, lack of certification card and professional insurance will result being denied access to the quarry. Minors require legal parent or guardian signature or entry will not be allowed. CAN anyone paddle or SNORKEL on kraken springs? Absolutely! Kraken Springs is a watersports park for the entire family. You may sign up and pay at the front counter for a watersports pass (same cost as entry for diving) and have access to any of our available watersports equipment or bring your own. Anyone in the water must have on a Lifejacket (PFD). Additionally, you are more than welcome to bring landlubber "Bubble Watchers" to enjoy the beautiful views of the quarry at no cost. If you would like to get the family in the water, one of Kraken Springs' expert Instructors are more than happy to take them on a Discover Scuba Diving tour of the quarry. No, We have no lifeguard on duty. All individuals must be either under the care of a training professional that has professional liability insurance, or are responsible as adults for themselves and any minors under their care. This is a large body of water that has natural and unnatural hazards and you are responsible for your own safety. Anyone in the water must have a PFD or BCD securely attached (with the exception of training under the care of a certified instructor). WHAT ARE THE WATER CONDITIONS (TEMPERATURE/VISIBILITY) AT KRAKEN SPRINGS? The water temp swings greatly depending on the depth and time of year and is layered in three distinct thermoclines. During the mid-heat, the surface temperature can be upwards of 85 degrees with a 10-15 degree drop around 20-25ft followed by another 10-15 degree drop around 40-45ft. During fall-spring, the surface temperature is cooler and less variations between thermocline layers. This will be similar diving to most inland bodies of water. Visibility can be between 15' to 40' depending on the weather, depth, and divers in the water. Generally the deeper thermoclines are much more clear and visibility is pretty good if everyone is kept off the silt bottoms. The water is actually some of the cleanest around! Kraken Springs is constantly replenished by an underground spring that constantly drains out, replenishing the reservoir. This, combined with the fact that the quarry is actually surrounded by a hill that the nearby drainage area washes around via Pettit Creek bypassing our body of water all together, keeping it in amazing condition. We test the water quality on a regular basis to ensure that our wonderful locations stays that way. The result is the same every time, it's limestone filtered drinking water! 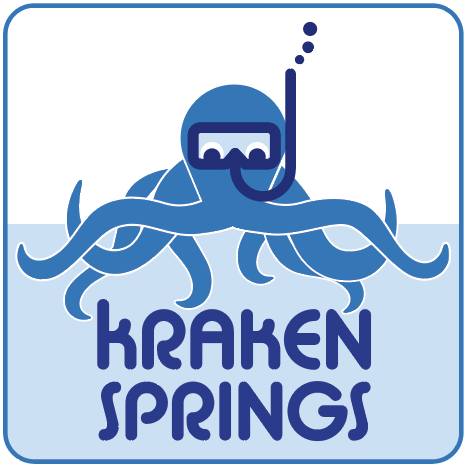 WHAT IS KRAKEN SPRINGS' POLICY ON SOLO OR SELF-RELIANT DIVING? You must hold, bring, and directly show a Solo or Self-Reliant certification with a major diving certification agency. Examples of Self Reliant certifications are PADI Self-Reliant Diver and SDI Solo Diver OR Full Cave (not cavern) such as PADI Tec Rec Technical Cave Diver and TDI Full Cave. You must be able to show you have the equipment to support a Self-Reliant dive via an isolated air stage (Pony Bottle, Twin Cylinders with Isolation Valve, Independent Doubles). You must sign a certified Self-Reliant liability form and follow the checkin procedures as outlined in the Quarry Policies and Procedures section. If you don't have your certification cards, the proper certification level, or do not have the proper equipment then you can not dive without a buddy. No exceptions will be made.